I made these today for Kelly's awesome playgroup Halloween Party! I wanted to make something Halloween-ish, but was very busy today and didn't have a lot of time. Behold Family Fun magazine. . .and a quick trip to Genaurdi's. Take String Cheese, cut a little ridge out of one end for the "nail". Chop green pepper strips into finger-nail shaped pieces. 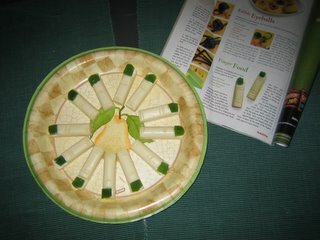 Press Green Pepper "nails" onto Cheese "Fingers". If you are feeling creative - you can cut lines for "knuckles"
A healthy and spooky treat for Halloween. The boys had a great time, and i think the grown-ups did too. thanks Kell!